This natural and organic cleanser is made with ingredients which cleanse and also nourish, soften ; helping the skin to keep its moisturising and balancing the skin pH. This care has cleansing and hydration properties, all in one! This care is traditionally called 'liniment' (Oleo limestone liniment). A very old recipe used for multi-purposes. Why Cleanser Milk is efficient? The facial cleanser is efficient because of its simple formula. This very simple formula perfectly cleanses all types of skin, from normal to sensitive, ever the most fragile, dry and hyper-reactive ones! And also even removes a heavy make-up! 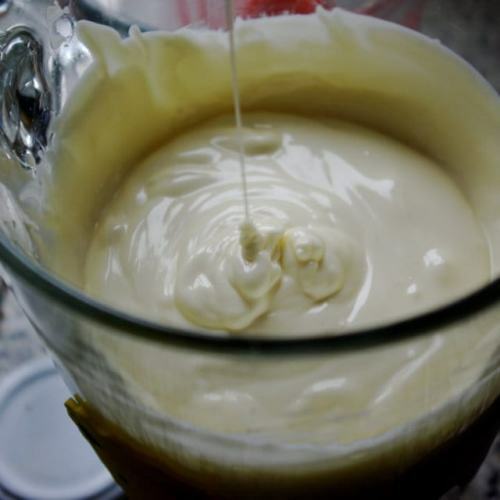 The process of saponification made from the simple ingredients used (carrier oils blended with the limestone water (calcium hydroxide + H2O)) creates a very soft surfactant slightly superfatted. In other words, a soap but without soap, that leaves your skin with a lipid film floating on your face surface. The cleanser has a creamy aspect of an ivory color, similar to a toilet milk. Color varies depending on the color of carrier oils used. How to Use the Facial Cleansing Milk? This cleanser milk has a basic pH. Our skin has an acidic one. So to balance our skin pH back to normal, we use a floral water which has an acidic pH. Which Floral Water to go with your Facial Cleansing Milk? This facial cleansing milk is suitable for your type of skin. There are as many as floral waters than the number of essential oils exist! Please, let us know if you have any allergy, before order your cleansing milk. This care contains sesame oil that can be allergenic in some people sensitive to nuts.